The cool thing about English is that no matter how well you think you know it, there’s always something more you can learn. Every so often, I discover that I had been making a mistake. In this case, it involved the words less and fewer. 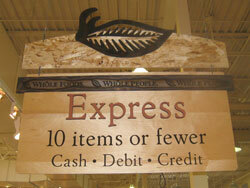 But where I went off the rails was with the phrase one fewer. I figured that if the noun was countable, then fewer was the way to go. (“I have one fewer duck than she has.”) Turns out, I was wrong. The proper phrase is one less. The logical argument is that one thing can’t really be counted. But the real reason is that no one says “one fewer.” Well, almost no one. I did. Update A couple of good posts on the same topic can be found at Jan Freeman’s Throw Grammar from the Train and Danny Dagan’s That Danny.